Lew Tendler is called “the greatest southpaw (left-hander) in ring history” by The Ring magazine’s editor-publisher Nat Fleischer. In 1961, Tendler became the sixteenth prize-fighter elected to the Boxing Hall of Fame. Yet, as great a fighter as he was, Tendler never won a championship. From his first professional fight in 1913, at age 15 years, until his final bout in 1928, Tendler fought the best in four weight classes, including seven world champions. A brilliant lightweight and welterweight, Tendler made just one career mistake: fighting in the same era as the legendary Benny Leonard. He would meet champion Leonard in two classic and widely heralded matches, losing the first bruising battle on a no-decision. Although the younger Tendler had soundly thrashed Leonard throughout their 12- round bout, the State of New Jersey (site of the July 27, 1922 match) had a “no-decision law” that meant a champion could only lose his title by a knockout. On July 24, 1923, nearly a year to the day later, a New York City crowd of 58,519 paid $452,648 to see the pair clash again for the title. It was the largest gate ever for the lightweight division. This time Leonard prevailed in a 15-round decision—decisions being legal in the State of New York. 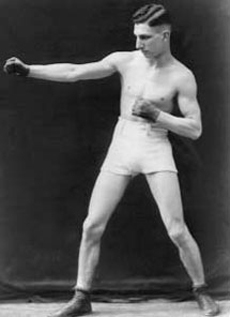 Lefty Lew moved up a weight class and defeated the two top contenders for the Welterweight Championship, Ted Marsh (4-round KO) and Sailor Friedman (10-round decision). Just 11 months after his second fight with Benny Leonard, on June 2, 1924, Tendler battled Mickey Walker for the World Welterweight crown. He lost a 10-round decision. Tendler’s professional record: 167 bouts—won 59 (37 KOs), drew 2, lost 11 (7 by decision, 3 on fouls, one KO by), 94 no-decisions, 1 no-contest.